Profitez de la vie à Ocean Village avec vue sur l'océan! Ce condominium joliment décoré de 1605 pieds carrés a deux chambres à coucher; chacun avec sa propre salle de bain. Il a tous les nouveaux appareils en acier inoxydable et nouvelle laveuse et sécheuse. Il existe deux grands balcons et la cuisine est-manger et entièrement équipée avec tout ce qu'il faut pour faire de délicieux repas. Le bar et ce condominium sont prêts à divertir vos invités. Ocean Village offre sécurité et d'assistance 24 heures par jour, un restaurant gastronomique, un bar tiki et un gymnase récemment rénové. Marines ont leur propre piscine privée chauffée, sauna et bain à remous. Grande piscine principale avec en rez-de piscine pour enfants situé à Seascape 8200. Piscine Cayman situé juste à l'extérieur du bâtiment Salle de remise en forme a été récemment rénové. Piscine principale possède un bar et piscine pour enfants Tiki. Condo est faiblement allergène avec elle étant entièrement carrelée et non fumeurs autorisés. Deux ascenseurs. Parking couvert. Restauration disponible. What sets this condo apart from many condos at Ocean Village is the beautiful ocean view. Cost is comparable to units that just have a golf course or landscape view. In addition the condo is furnished with everything you need from beach chairs, towels, coffee grinder, even a orange squeezer so you can have fresh squeezed orange juice each morning as you watch the sunrise. The condo is very spacious with plenty of room for 4 people. The two bedroom/bath areas are in different wings so there is good privacy. The owner was very personable and responded quickly to our inquiries during the rental process. The condo was well stocked with basic supplies to get you started. Enjoy your stay!! We Loved It!!! The condo had everything we needed for a great vacation . This was my first time renting through VRBO and I couldn't have asked for a better experience. Jill was so helpful and accommodating. Ocean Village was beautiful!!! I have beautiful sunrise pictures taken from the balcony. The condo acccomidated us with room to spare. We had everything we needed for the beach provided in the garage. Loved having a parking space provided with the condo. We would certainly rent this condo again . Thanks Janie for choosing our condo for your vacation! I am so glad you and your family enjoyed your stay. I am the lucky one to have such a wonderful family stay at our condo. All our communication helped me to get a sense of you and put me at ease:) I worry... are our renters happy with everything? I am also glad that you had a good experience trying VRBO/HomeAway. I do hope you return but to any future owners...You couldn't ask for a better family! Thanks again! Wir haben als Familie eine Woche in dieser Wohnung verbracht. Positiv hervorzuheben ist die wunderschöne Lage im gepflegten Ocean Village Resort direkt am Meer. Die Wohnung ist sehr hell und geräumig und hat einen schönen Ausblick. Sie könnte bei entsprechender Pflege sehr schön sein, leider haben wir sie jedoch sehr verdreckt und in schlechtem Zustand vorgefunden. Bei unserer Ankunft waren die Bettdecken sehr schmutzig und es waren keine frischen Laken aufgezogen. Wir haben im Schrank noch welche gefunden, die wir aufgrund ihres muffeligen Geruchs jedoch erst waschen mussten. Das Gleiche gilt für die Handtücher in beiden Bädern. Alle rochen derartig schimmelig, dass wir auch diese vor Gebrauch zunächst waschen mussten. Der Fußboden in der Wohnung war so schmutzig, dass man schon nach wenigen Minuten barfuß laufen schwarze Fußsohlen hatte. Unter den Betten lagen neben viel Staub gebrauchte Taschentücher, Bonbonpapiere und anderer Müll herum. Die auf den Fotos schönen weißen Sofas waren in der Realität fleckig und müssten dringend gereinigt werden. Fußboden und Möbel des einen Balkons waren derartig schmutzig, dass wir ihn nicht nutzen konnten. Der andere war etwas besser, aber auch alles andere als einladend sauber. Im Küchenschrank wimmelte es zwischen alten Gewürzen von kleinen Tierchen, so dass wir dort nichts hineinstellen mochten, Geschirr und Bestecke waren teilweise schmutzig und klebrig. Wir haben uns immer wieder gefragt, wofür wir eigentlich die hohe Cleaning fee bezahlt haben und können die Wohnung leider nicht weiter empfehlen. First, booking on HomeAway could be easier! Annoying lagtime w memos sent back & forth to owner almost cost us the condo! Once we established our own communication channel much easier! Jill is a flexible pleasure to deal with. Key mailed prior to our arrival, paperwork w map, directions, explanations of items in the unit, & on grounds. Easy ride to Ft Pierce & around Hutch Island. Condo has good # of menus nearby excellent restaurants; dont missSat am Farmers Mkt! Arriving at Ocean Villages, Security very polite & efficient. Easily found unit's building & unloaded luggage, easy access to 4th floor via elevator. Parking close by in covered port, w huge storage bin in front of it stuffed w beach gear & 2 bikes (tire pump in one of bike baskets). Pictures here are true to reality. Opened the door,everyone thrilled at first sight! Lovely comfortable furnishings, gorgeous views of the ocean & Ocean Villages grounds from the huge 4th floor windows. My family of 4 (2 teenagers) settled in quickly. Rooms are spacious, as are closets & bathrooms. Unit is extremely well stocked w towels, beach towels, extra blankets, pillows. Beds all very comfortable. TVs in each bedroom & large HDTV in living area. Basic cable & fast reliable WiFi in the unit. Kitchen is nice sized, also stocked w everything one might need ..glasses, mugs, dishes,serving platters, pans, blender, coffee maker, dishwasher (a bit dated.. careful w the door it's heavy & can crash down) good sized fridge, garbage disposal. Everything clean & functions well. A wet bar & huge pantry closet across the hall from kitchen also well outfitted. (Only thing missing was plastic cups & coffee mugs for pool). Washer/dryer in closet just right of front door. Opened patio doors, set back the windows & enjoyed the refreshing ocean breezes. Unit has AC but barely needed. SeaScape heated pool & hot tub exclusive to tenants of those bldgs (wear your provided wristband once you're on grounds) short walk from front of condo bldg, was never crowded. Beach is just beyond the pool. The OV complex is wheelchair friendly, makes vacation fun for everyone. There's golf, tennis, basketball, bocci. Tiki hut at main pool serves reasonably priced good food & generous drinks, good people watching. Ride a bike over! The library has diverse selection for poolside reading. Seems they have thought of everything,even hoses & sinks at ocean entries for rinsing off sand! We all enjoyed our stay immensely & will return! Lovely view .. Needs updating.. Ocean Village is a very nice property with many amenities and a beautiful beach. This rental is a corner unit on the fourth floor with lots of windows. We loved having two swimming pools within easy walking distance -- one pool is strictly for the Seascape I residents/renters and includes a hot tub and sauna. The week we stayed in Fort Pierce was exceptionally toasty and humid for November. We spent hours in the pool. It was heavenly. I chose this unit specifically because it had three beds that looked comfortable for adults (and a good view of the ocean). Both bedrooms have sliding doors that open to balconies. My cousin, sister and I watched the sun come up over the ocean every morning on one of the balconies with our coffee. The condo was clean and had everything we needed. We only ran into a few bumps. The balcony doors were a little difficult to open but were fine once opened. I would recommend not closing the doors completely when on the balcony. The condo owner's daughter was a dream to work with and answered any questions we had. We loved all the space inside the condo. We also liked having good seafood restaurants close by. Archie's is less than two miles away with outside seating with live music at night. Food prices were reasonable and the atmosphere was very casual. 12A Buoy restaurant and Chuck's Seafood are also very good. I continue to appreciate the wonderful renters that have chosen our condo. In this case, I felt so at ease in our email communications that if I could give a renter a star rating; they would be a solid five star! Our thanks to these "exceptional" renters!! Autres Activités: Shopping, nautique, écosser, observation de la faune, Santé / Beauté Spa, Mini-golf, shuffleboard, pétanque, et plus encore. 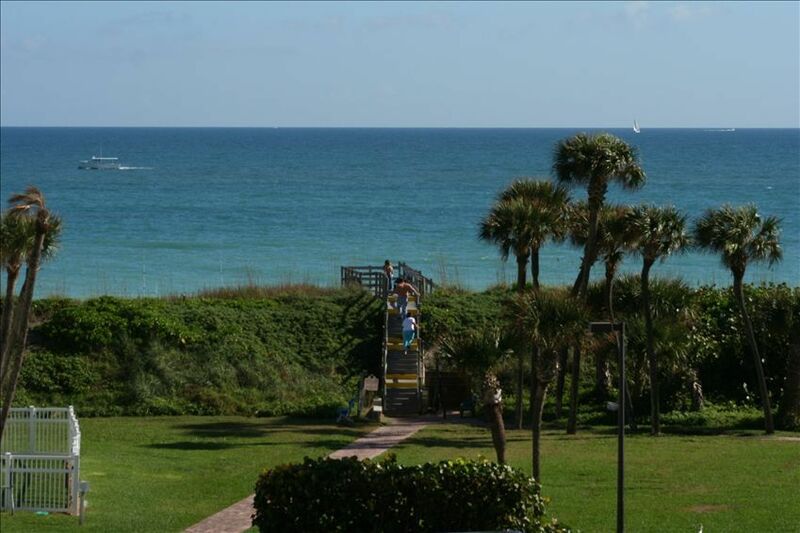 Ocean Village Resort est situé sur South Hutchinson Island de Fort Pierce, en Floride. Ceci est de 30 minutes. au sud de Vero Beach et juste au nord de Jensen Beach de Port St. Lucie. Cleaning fee is $100 and $110 for weekend arrivals.